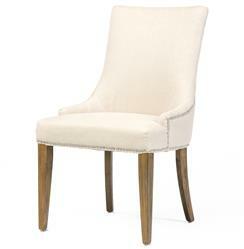 This pair of modern dining chairs has a French Country accent. The tropical hardwood frames are finished in distressed grey, welcoming guests to linger and enjoy a meal or conversation. Upholstered with a beautiful, blended cream cotton and linen fabric, with an antique nail head trim, the curved backs are elegant and inviting.